Vancouver, B.C. 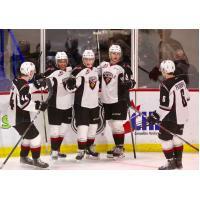 - For a second straight season the Vancouver Giants (37-13-2-1) are headed to the WHL playoffs. Sunday afternoon in front of 3663 strong at the LEC the Vancouver Giants skated to a 4-1 victory over the Prince George Cougars (16-32-4-2), becoming the third team in the WHL to clinch a berth in the playoffs. Davis Koch, Justin Sourdif and Tristen Nielsen all scored third period goals, breaking open a 1-1 tie. Between the pipes, David Tendeck turned aside 31 of the 32 Cougar shots fired his way. Ethan Browne had the lone goal in response for the Cougars while Taylor Gauthier made 28 saves in the Prince George net. PG - Ethan Browne (8) opened the game's scoring at 9:00 of the first period off a power play. Cole Moberg and Ryan Schoettler assisted on the play. VAN - 42 seconds into the middle frame Jared Dmytriw (12) tied the game off the rush off a feed from Jadon Joseph. Bowen Byram added the second assist on the tying marker. VAN - Davis Koch (22) put the Giants ahead at the 7:06 mark when he roofed a shot over Taylor Gauthier's left shoulder from the left-wing circle. Bowen Byram earned the lone assist on the goal. VAN - Justin Sourdif extended the Giants lead to 3-1 at the 11:35 mark of the third when he knocked home his own rebound from the slot. Davis Koch set the goal up with a slick feed from the left-wing corner. VAN - With the team's skating four-on-four, Tristen Nielsen stripped the puck away in the neutral zone, skated in alone and roofed his 10th of the season past Taylor Gauthier to make it a 4-1 game. - Sunday's win marked the 37th victory of the season for the G-Men which surpassed their victory total from last season. The Giants still have 15 games remaining in their season. 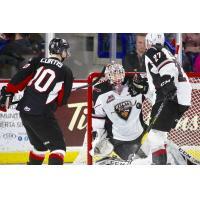 - The Giants wrapped up their season series with the Prince George Cougars with an 8-1 record. They finished 4-1 against the Cougars at home. - The Giants have won five straight games and are now 14-1-0-1 in their past 16 games dating back to January 6th. - Defenceman Bowen Byram was assessed a five-minute major penalty and a game-misconduct at 13:48 of the third period after a collision with Cougars forward Mitchell Kohner. 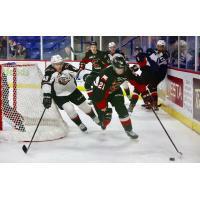 Giants head coach Michael Dyck defended Byram after the game saying: "I thought it was a clean hit. I thought he finished his check. It wasn't a blow to the head, it was a clean check to the shoulder. He didn't make head contact and you can clearly see that in the video." - The Giants lost forward Brayden Watts early in the first period after a collision with Cougars defenceman Rhett Rhinehart. Watts left the game and did not return, leaving the Giants to play virtually the entire game with 10 forwards. - The Giants head into this week's action one point back of the Everett Silvertips for top spot in the Western Conference standings.